Are you saving trays in case an inmate gets sick? Are your trays out of order, falling over, or just a mess in the freezer? 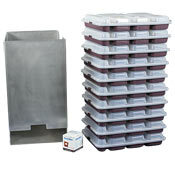 With the Cook's Dead Man Box, you can stack and store up to 9 trays with lids in a neat, organized manner. Simply pull the oldest tray from the bottom and place the new tray on top. Each tray will rotate out of the box every 3 days.